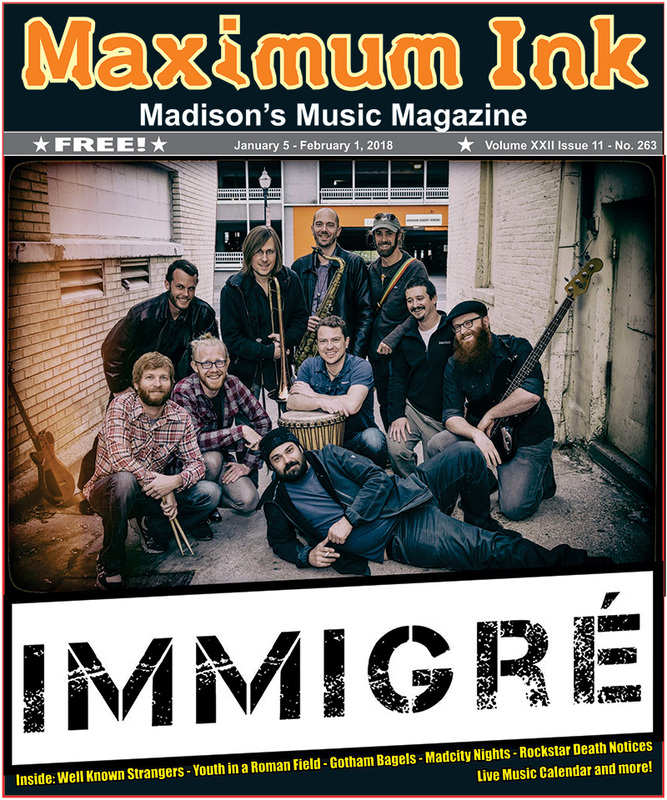 The love of the musical and cultural message of Afrobeat is what inspired this group of accomplished and prolific musicians join forces and form what would be known after 2012 as Immigrè. Citing influences such as Tony Allen, Fela Kuti, Antibalas, Amadou & Mariam to name a few, Immigrè ‘s high energy, uniquely fresh sound is undeniably contagious. The band’s original track “Djiguiya” immediately creates a frenzied space of rhythm and melodies, driving the body to celebrate. And the funky juxtaposition of horns and keys on “Jakumaba” transport you into an electrifying world running rich and deep in infectious grooves. In speaking with Ryan Lammey, Immigrè’s bassist, there’s one big challenge to getting things going full speed: Successfully navigating the google calendar of ten plus worldly musicians with side projects to arrange time to get together to create and play the music. “Well, our drummer is in Brazil, bari sax player is in Thailand, keyboard player is in Ecuador”, Lammey writes on Facebook messenger in response to my interview request availability. “But they’ll all be back for the show at The Frequency on the 20th of January”. The Afrobeat genre began in Ghana in the late 1960s, coined by a Nigerian born man named Fela Kuti. His music served as a powerful social and political movement against the political corruption of the Nigerian government, poverty and inequality. Kuti’s 1986 song “Beasts of No Nation” inspired the 2005 Uzodinma Iweala’s 2005 novel, which was made into an award-winning movie starring Idris Elba in 2015. Characterized by a fusion of jazz, Fuji and heavy Nigerian drumbeats, Afrobeat bands are “big bands” with typically 15-30 musicians made up of vocals, guitar, bass, horns, keyboard and multiple percussion pieces. Since 2012, Afrobeat has made a resurgence in influencing pop culture, especially in the UK with more and more Afrobeat nightclubs opening each year. Lammey recalled how the band began quite unexpectedly at a backup rhythm section rehearsal for local Wassoulou musician Tani Diakite and the Afrofunkstars. Lammey was drawn to the Afrobeat sound since studying music at Indiana State University. Although guitar was his focus, he quickly learned that in the music business “bands are always looking for a bassist”, so he transitioned from six strings to four (which he admits, fits better with his brain). Ryan acknowledges that in growing an audience for Immigrè, people will need something in their hands to take home and play. He insists with conviction that the band will have a full album released in 2018.